Gas related symptoms. Bloating and discomfort. 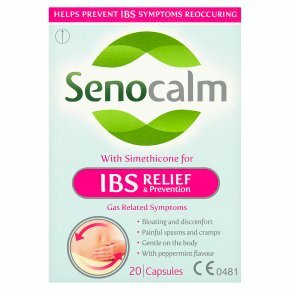 Painful spasms and cramps.- Contains simethicone - Helps relieve and prevent gas related symptoms of irritable bowel syndrome (IBS) like painful spasms and cramps - Helps relieve and prevent bloating and discomfort - Gentle on the body - Senocalm is a medical device. Always read the instructions. Direction for Use Take Senocalm capsules with a glass of water, after a meal or before you go to bed. The capsules can be taken three times a day, however, if you forget to take a dose, Do Not Take a Double Dose. The capsules can also be used to prevent bloating. See your Doctor if you think you have IBS symptoms so they can try to determine the cause Age: Adults and children aged 14 years and older, Capsules per dose 2-3 Capsules, Maximum capsules per day 9 Capsules Age: Children aged 6 to 14 years, Capsules per dose 1 Capsule, Maximum capsules per day 3 Capsules Read the patient information leaflet carefully before using the product. WARNINGS AND PRECAUTIONS<br>FOR ORAL USE ONLY. KEEP OUT OF SIGHT AND REACH OF CHILDREN.<br>Do not use the Senocalm capsules after the expiry date as printed on the blister and outer box. This product is not intended to relieve constipation or diarrhoea.